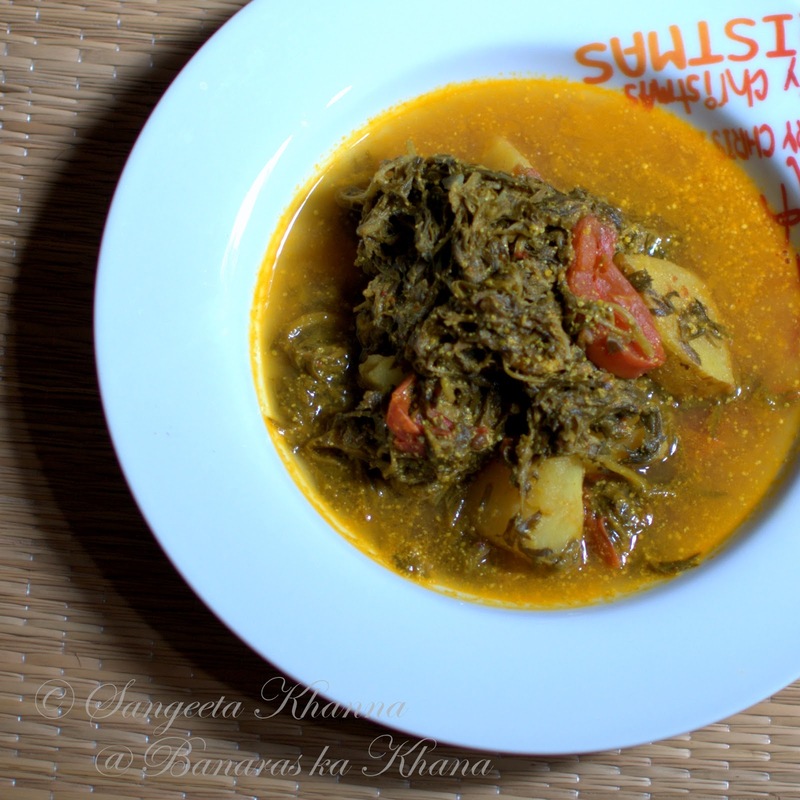 banaras ka khana: Chane ka saag (chickpea greens) in mustard based curry | chane ke saag ki sarson waali subzi..
Chane ka saag (chickpea greens) in mustard based curry | chane ke saag ki sarson waali subzi..
Chane ka saag is not something many of us would come across very often. I know many of you wont even know this green leafy vegetable. This is the tender shoots of the chickpea plant, it is plucked before the plant bears pods, plucking or pruning the plant helps it grow thicker, bear more branches and more fruit while it grows. See how the greens look in the dumplings recipe here. My grandmother used to say so fondly about chana (chickpeas), it is eaten in so many forms, so many ways. Being a staple crop all across central India, we see many different recipes originating from all over the places. This one is a thin gravy curry that has a base of mustard paste. The chickpea greens (chane ka saag) is not chopped and is left as it is after trimming the hard base. See the picture here, how the trimmed ready to use saag looks. This curry used to be a winter regular at my parent's place, especially when my grandmother would be with us. She was brought up in Bengal and all kinds of mustard based curries were her favorites. We used to love them too but she was the one who would plan and get the mustard finely ground on the stone Silbatta (flat type mortar and pestle), clean the greens and then sometimes cook it too. Simple rustic looking curries with great flavors. She used to cook a similar one with small oblong Aubergines too, something I haven't cooked for a very very long time. I used mustard powder this time, this was after one of the readers suggested that the powder also gives good results. It was very convenient and the taste was exactly the same when a wet paste of mustard is used. The consistency was a little thinner than the wet paste but that is not such a big concern if you like the taste. The mustard powder doesn't emulsify nicely into the cooking gravy, as seen in the picture but he taste remains the same. You could add a tablespoon of almond meal to the gravy to make it creamy like it comes with a wet mustard paste, or just smash some of the potato cubes after cooking. Clean the potatoes by scrubbing all the dirt as we are using potatoes with skin. New potatoes are used for this, quite obviously in India as both chane ka saag and naya alu comes in the same season. Cut the potatoes in thick wedges or cubes. Heat the oil in a pan or pressure cooker pan (I used pressure cooker) and tip in the fenugreek seeds. Let them get just fragrant and pinkish brown, they turn bitter if they get burnt so take care of that. Add the potatoes immediately. Toss and stir fry for a minute on high flame. Add the powdered spices , toss to coat well for about 30 seconds and then add the tomatoes and salt to taste. Toss and cook for another minute or so. Add all the chane ka saag , add a cup of water and cover the lid. If cooking in a pan, you have to add some more water and let the curry simmer for about 20 minutes. In pressure cooker, just till the pressure whistle blows. Take off the burner and let it cool to open the lid. Adjust seasoning and consistency and serve hot. I like it as a soup too. This curry tastes great with plain boiled rice and since I am not much a rice eater and still want a large quantity of this curry, this is my way of enjoying it. In a soup mug with loads of the chcikpea greens , few potato cubes and just 2 tbsp of boiled rice. It can be served as a side dish with another sookhi subzi , raita, chutneys etc for company. The greens in this curry have a wonderful flavor when combined with mustard. 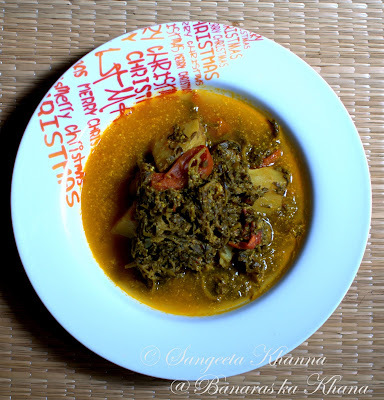 When eaten raw, the chane ka saag tastes quite savory and can be added to salads too, cooked in a curry like this, you will find yourself fishing for more chane ka saag in the curry. Tomatoes make it a little tart or you are supposed to use amchoor if the tomatoes are not tart. So this tartness and presence of mustard makes the greens taste slightly like a pickle. I just love it. 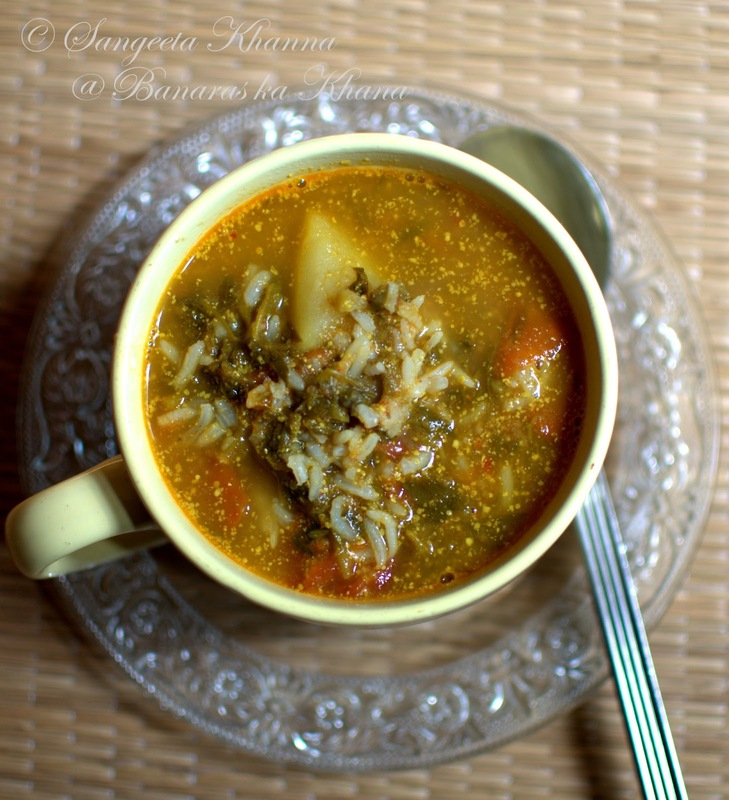 This curry is definitely a Bihari or Eastern UP specialty but the influence is clearly from Bengal. The Bengalis make mustard based curries differently though. More pungent ans some sugar used to balance. This curry has the pungency balanced with tartness of tomatoes. You can use raw Plantains, slit aubergines or flat beans instead of chane ka saag in this recipe. Or just make it with the potatoes. I am sure it will be liked by all, especially if you love mustard oil and mustard seeds seasoning. LEt me try this with what is available here- maybe aubergines. Sounds delicious! Have bookmarked this to make this week - looks divine!